I've always loved facial serums. It never occurred to me that I could benefit from a body serum as well. 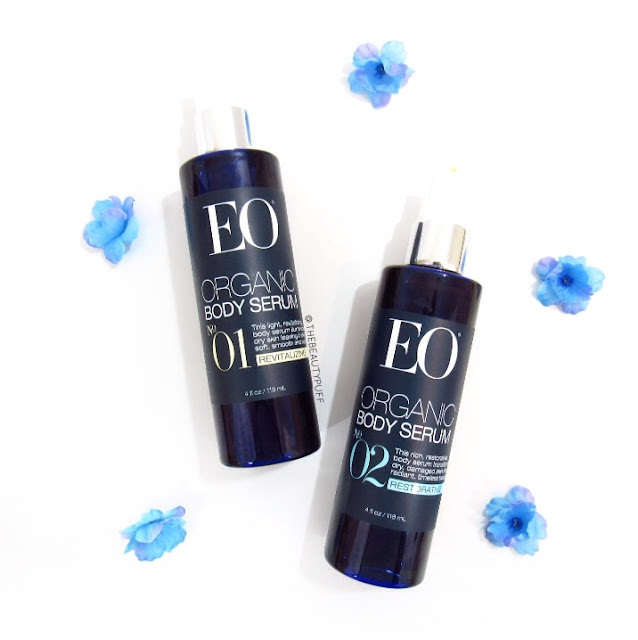 EO Products has come out with body serums in two variations - Revitalizing and Restorative. Formulated with plant oils, these serums penetrate the waterproof barrier of the skin to deliver nourishment where it is needed the most. Both of these serums soften, condition, and tone skin while providing anti-aging benefits. They have a silky texture and absorb quickly without leaving a greasy residue. I use the Revitalizing serum during the day and the Restorative serum at night. I've enjoyed incorporating these serums into my routine for soothing and fast-absorbing hydration. I do prefer the scent of the Revitalizing serum - it has a fresh citrus scent from the orange essential oil. I will definitely love that as we head into spring! The Restorative serum feels very soothing at night and I definitely notice the more floral/herbal smell from it. If you are looking for more intense hydration, I would definitely recommend the Restorative Serum. For warmer months and lighter hydration, the Revitalizing serum is perfect. These serums contain no synthetic fragrances or gluten and are cruelty-free!